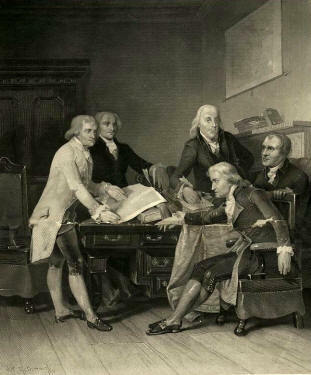 enlightened gentlemen in elegant clothes sitting decorously at a table and writing a document that would stand for centuries as the cornerstone of a stable democracy. The pictures don’t show the quarrels and struggle that went on when people decided to pursue independence and later to write a constitution that would make the new country possible. And the pictures show only half of the story—there are no pictures and seldom any mention of the women who inspired those men and sometimes goaded them into action. Pictures can’t show the whole story. You have to read the words behind the pictures to get a closer look at our revolutionary leaders. Last year I read a biography of Mercy Otis Warren, who, like her good friend Abigail Adams, influenced many of the men who fought in the Revolution and went on to start a country. Mercy and John Warren’s home became a meeting place for leaders who organized the Boston Tea Party and fought for the rights of the colonies to organize their own governments. 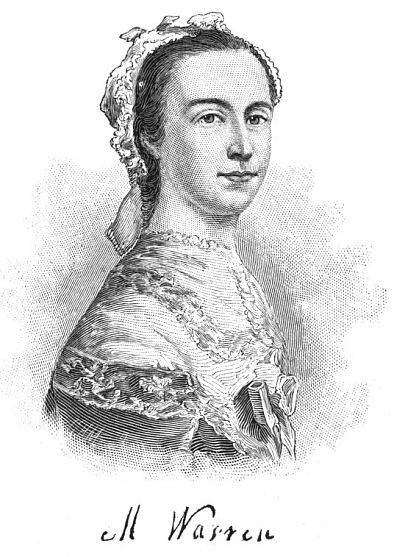 Even though women were not encouraged to participate in public life, Mercy Warren began writing pamphlets and satirical verses and dramas that supported the Revolutionary cause. And bid to empire and to crown adieu. The years following the Revolution brought little peace to Mercy Warren and her husband as they disagreed with many of the decisions of the Federalists who controlled the government. James Warren, who had been a leading figure in the war for independence, was shut out of government service and his sons struggled to find posts. When a new constitution was drafted and presented to the states, Mercy Warren opposed its ratification. She wrote a pamphlet “Observations on the New Constitution…” in which she urged the states to reject the draft. One of her major objections was the lack of a bill of rights “There is no provision by a bill of rights to guard against the dangerous encroachments of power” she wrote. She was also concerned about the six-year terms given to senators. “A Senate chosen for six years will, in most instances, be an appointment for life…” (Well, she was right about that, wasn’t she? Many Senate terms have lasted for a generation or more.) She worried that there were no defined limits to judiciary powers and that the executive and legislative branches were dangerously blended together. The Constitution certainly did not seem a sacred document to her. As we all know, the Constitution was ratified and has become the basis of American law. Some of Mercy Warren’s concerns were addressed very early. The passage of the Bill of Rights can be attributed in part to her demands. Other aspects of government continue to be addressed such as the power struggle between the Legislative and Executive branches. But the Constitution survives and so does the country. Reading about the early struggles for democracy in America can give us some hope that our leaders in Washington will eventually find a way to work together and solve some of the problems confronting our world today. The past may look peaceful as we gaze back at the solemn pictures of Founding Fathers, but revolution is never easy, and it never solves all of a society’s problems. America was designed by a quarreling group of imperfect men and women. And every Fourth of July has been celebrated amidst continuing arguments and struggles to make the country more democratic for all its citizens. Don’t let those elegant suits and quill pens fool you—life in a democracy is never peaceful and free of strife. If you want to read more about Mercy Otis Warren, there is information about her in Cokie Roberts’s book Founding Mothers. For a complete biography, I highly recommend Muse of the Revolution: the Secret Pen of Mercy Otis Warren by Nancy Rubin Stuart. Thanks for your interesting post. I’s a reminder of the mostly “minor” yet decisive roles played by women throughout history. Strange how often their efforts, foresight and sheer determination remain unacknowleged if not unheard of. Makes one wonder about today’s “history in the making”. Excellent! Thanks for bringing knowledge and insight to subjects (the Constitution AND the men who signed it) that are too often the focus of blind idolatry. This is a valuable post!